Furthermore all information is collected which is required to fulfil the contract. The processing of personal data starts with your inquiry and is necessary for above reasons, to process your order and to fulfill obligations arising from a contract. The collected personal data are stored until the end of the legal storage obligation for merchants (6.8 or 10 years after the end of the calendar year in which the contractual relationship was terminated) and then deleted. By way of exception, this does not apply if we are obliged to retain storage for a longer period due to tax or commercial storage requirements (in accordance with HGB, StGB or AO) or if you have consented to storage beyond that. Job application and relevant appendices will be only read by the relevant manager with the purpose of answering and assessing the content in relation to a defined job. Job applications and CVs are shared internally only with relevant persons and will not be disclosed to anyone outside of CBS - Carsten Daus GmbH. Job applications and CVs are kept until the right candidate is found and the recruitment process has been completed - after it will be deleted or returned. No personal data of minors (persons under 18 years) are requested, stored or forwarded by us. Should such data be transmitted to us, they will be deleted immediately upon becoming aware. If you would like to receive the newsletter offered on the website, we need an e-mail address from you, as well as information that allows us to verify that you are the owner of the specified e-mail address and that you agree to receive the newsletter , further data is not collected. We use this data exclusively for the delivery of the requested information and do not pass it on to third parties. The granted consent to the storage of data, as well as their use for sending the newsletter, you can revoke at any time, by using the "unsubscribe" link in the newsletter. This site uses SSL encryption for security and to protect the transmission of sensitive content. You can recognize an encrypted connection by changing the address line of the browser from "http: //" to "https: //" and the lock symbol in your browser line. If SSL encryption is enabled, the data you submit to us can not be read by third parties. A transfer of your personal data to third parties will not take place. Exceptions to this apply only to the extent necessary for the execution of contractual relationships with you. This includes, in particular, the transfer to service providers or other third parties whose activity is necessary for the performance of the contract (eg shipping companies, tax consultants or banks). The transferred data may only be used by the third parties for the stated purposes. Without expressed permission of the user, we will not sell, trade or rent any information about our users to third parties. We reserve the right to provide user information in individual cases, eg. If, for example, we have reason to believe that this is necessary to establish the identity, to contact or to take legal action against anyone who has caused any infringement (or threat of infringement) or any other harm (whether negligent or otherwise) to disclose our reputation, rights, interests or property, or those of other users, or anyone who may be harmed by such activities. We also reserve the right to provide personal information, without notice to the user, at the request or resolution of a court or agency, or in good faith, as required by law, regulation, etc., or through a stock exchange, Government, Ministry, etc. is required to post. Every data subject with processed personal data has the right to file an objection at any time based on reasons arising from their particular situation against the processing of personal data relating to him/her which ensue in accordance with article 6 section 1 (e) or (f) of the EU-GDPR. This also applies to profiling based on these provisions. We no longer processes the personal data in the case of an objection unless we can prove compelling legitimate grounds for the processing that outweigh the interests, rights and freedoms of the data subject, or the processing serves the assertion, exercise or defence of legal claims. If we are processing personal data in order to engage in direct advertising, the data subject then has the right to file an objection against the processing of personal data for the purpose of such advertising at any time. This also applies to the profiling provided it is connected to such direct advertising. If the data subject objects to the processing for the purposes of direct advertising by CBS - Carsten Daus GmbH, we will then no longer process the personal data for these purposes. Every data subject with processed personal data has the right to request the immediate rectification of inaccurate personal data relating to him/her. Furthermore, the data subject is entitled to the right to request the completion of incomplete personal data – also by means of a supplementary statement – bearing in mind the purpose of the processing. If one of the above-mentioned reasons pertains and a data subject would like to initiate the deletion of personal data that are stored, he/she can appeal to the controller for this at any time. The data subject’s deletion request is then complied with immediately. If one of the above-mentioned requirements is given and a data subject would like to request the limiting of the personal data that is stored, the data subject can appeal to the controllers for this at any time. The limitation of the processing is arranged for immediately. Every data subject with processed personal data has the right to receive the personal data relating to him/her which were supplied to the controller by the data subject in a structured, current and machine-readable format. The data subject also has the right to transfer these data to another controller without interference from the controller to whom the personal data was submitted provided the processing is based on the permission in accordance to article 6 section 1 (a) of the EU-GDPR or article 9 section 2 (a) of the EU-GDPR or based on a contract in accordance with article 6 section 1 (b) of the EU-GDPR. Moreover, the processing occurs with the aid of automated processes provided the processing is not necessary for the realisation of a task carried out in the public interest or in the exercise of official authority granted to the controller. After providing personal data to CBS - Carsten Daus GmbH, the user has always the option of having these details deleted at any time. Therefore the user has to inform us by sending an e-mail or a fax message. Our website may contain links to other websites. CBS - Carsten Daus GmbH has no influence whether the operator of the other website adheres to the legal provisions of data protection or not. By the use of this website the user accepts these conditions. The data and information on our website is accurate. However, CBS - Carsten Daus GmbH accepts no liability or warranty for the completeness, topicality or correctness of data or information provided. All liability claims regarding material or immaterial damage caused by the use of any data and information provided, including any kind of data and information which is incomplete or incorrect, will therefore be rejected. Something else applies when on the part of the legal representative, chief executive or simple vicarious agent a provable deliberate and careless default exists. All offers on our website are not binding and without obligation. Moreover CBS - Carsten Daus GmbH reserves the right to make changes, amendments or cancellations, without prior announcement, to any data or information provided. Our website may contain external hyperlinks to other websites provided by thrid parties and that aren't in the area of our responsibility. A liability for any content linked or referred to from our website might only occur if we has a subjective knowledge of the content and in case of illegality a prevention of use is technically possible and appropriate. In this respect we expressly declare that in the time the link has been set no illegal content or illegal acts were visible. We don't have any influence on the update version or its future development, the contents or the authorship of the linked website. Therefore we dissociate from all contents of the linked websites that were changed after setting the link. This statement applies to all links, referrals and foreign entries set on this website. If any damage occurs by the use or disuse of illegal, deficient or uncompleted information presented on the linked website, only the author of the respective website might be liable, not CBS - Carsten Daus GmbH who has only linked to the website. As soon as we get knowledge of illegal content or illegal acts on linked websites we will remove that link from our website immediately. CBS - Carsten Daus GmbH respects the copyright law and expects that all users of this website do the same. Not permitted copying and distributing of copyright protected work is breaking the legal right of the owner of teh copyrights. All content of this website, including but not limited to the texts, the design of this website, pictures, logos and graphics are protected by copyright law. Any text, portions of texts, pictures, logos or graphics may only be used under prior permission in written from CBS - Carsten Daus GmbH. The only materials that are excluded from this regulation are texts and graphics available under the sections "Downloads" and "News". 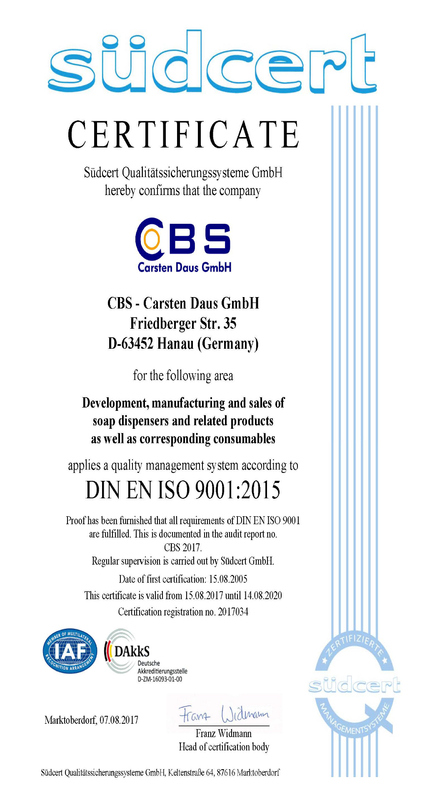 It only lies in our discretion and depends on the circumstances whether CBS - Carsten Daus GmbH expresses only warnings or introduces legal steps. The data published by us in the context of the imprint represents no concluded agreement for the forwarding and/or transmission of advertising measures. We ask to not forwarding unwanted advertisement and reserve the right for legal steps..